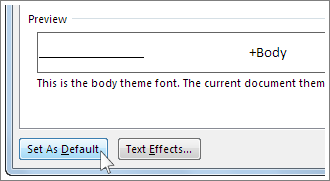 To use your favorite font in Word all the time, set it as the default. If you’ve already changed the default font and the new setting isn’t sticking, scroll down to read about more things to try. Click Home, and then click the Dialog Box Launcher arrow in the Font group. Under Font, click the font you want to use. Under Size, click the size you want to use for body text. Click All documents based on the Normal template. Now all new documents will use that font, unless you start with a custom template. To use a different font for one document, follow the same steps, but in step 5 click This document only. Sometimes, a company’s permission settings or some add-ins change the default font back to the original font. If that’s happening, here are some things to try. In the Search box, type Normal.dotm and click Search. Right-click Normal.dotm, and click Properties. On the General tab, make sure Read-only isn’t checked. If it’s checked, uncheck it. Click the Security tab. Under Group or user names, click your name, and then make sure you have Write permission in the Permissions box. If you aren’t able to uncheck the Read-only box or if you don’t have Write permission, contact the person who’s in charge of your company’s computer systems. In the Add-ins box, find one of the add-ins you want to turn off and note the add-in type listed in the Type column. Click that add-in type in the Manage list, and click Go. For example, click COM Add-ins, and click Go. Uncheck the boxes for the add-ins you want to turn off, and click OK.
Repeat steps 1-4 for other types of add-ins. After you change the default font, turn on the add-ins. Click an Add-in type in the Manage list, and click Go. Check the boxes for the add-ins you want to turn on, and click OK.
Repeat steps 1-3 for the other types of add-ins you want to turn on. Note: You don’t have to turn off the Document Inspector type add-ins.